In celebration of the birth centenary of Mexican painter Frida Kahlo, Instituto Cervantes de Manila brings together talented Filipino women artists from diverse fields in paying tribute to her artistic legacy. Instituto Cervantes de Manila, Spain’s cultural organization in the Philippines, is holding a series of cultural events honoring prominent Mexican painter Frida Kahlo (1907-1954) this whole month ofJuly. On July 6, 2007, one hundred years after the birth of Frida Kahlo, Instituto Cervantes will commemorate her artistic legacy by inviting female Filipino artists from various fields to pay homage to the immortal artist. Writers Jessica Zafra and Marjorie Evasco, sculptress July Lluch, filmmaker Ellen Ramos, visual artists Steph Palallos and Wawi Navarroza, and dancer Myra Beltran will take part in Queremos tanto a Frida - Mahal namin si Frida. All activities will be held at the Instituto Cervantes premises. Frida Kahlo, an artist and feminist icon, is well known for her self-portraits that depicted her emotional pain and physical suffering through symbolism. She has gained the respect of the artistic world and has even become a popular figure. Her husband was the equally famous Mexican muralist Diego Rivera. Several movies have been made about her life. One of the best films about her is Frida, Naturaleza Viva, which was directed by Paul Ledouc in 1984. This film will be shown at Instituto Cervantes on July 6 at 6 p.m.
Later in the day, Jessica Zafra will be reading her article "Contra Frida Kahlo" to the public. Her article is a criticism against the media’s portrayal of Frida Kahlo. Artist Julie Lluch will present her Bust of Frida sculpture. There will also be a photo exhibit by Wawi Navarroza entitled "Abducted," which will feature her photographs influenced by Frida Kahlo and her paintings. Another interesting display will be the wire sculpture by Steph Palallos, which is based on the Mexican artist’s self-portrait, "The Two Fridas" (1939). This self-portrait depicts the fragmented side of her personality—the traditional Mexican woman and the modern "European Woman." 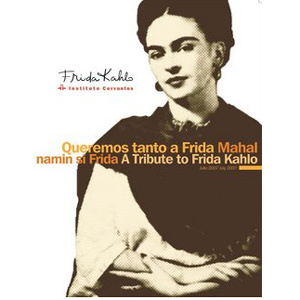 The Embassy of Mexico and Instituto Cervantes will present Mexican Cinema in the Times of Frida Kahlo, a cycle of films produced during the last decade of Frida Kahlos’s life. The cycle features four films directed by the movie industry giants Emilio Fernández and Luis Buñuel: María Candelaria (to be screened on July 7, 6 p.m.), Víctimas del pecado (to be screened on July 14, 6 p.m.), the classic Los Olvidados (to be screened on July 28, 6 p.m.) and A Woman Without Love (to be screened on July 21, 6 p.m.). On July 14 (Saturday), Marjorie Evasco and Nityalila Saulo will be presenting a joint-performance inspired by the great artist. One week later, on July 21 (Saturday), Ellen Ramos will be presenting a film inspired by Frida’s most surreal work, "What the Water Gave Me." In this video, water literally becomes a reflective surface where the real and imagined merge. On July 28 (Saturday), the Frida Kahlo month will come to a close with Myra Beltran premiering her piece "Frida before the Mirror." Beltran will be juxtaposed against images of Frida Kahlo’s paintings. As the dancer writes her emotion with her body’s movements, constricted due to Frida’s physical disabilities, she also writes her body into canvas, just like Frida’s inscription of her body in her work. This symbolizes her liberation as an artist and as a woman. The centenary of Frida Kahlo’s birth will be celebrated not only in the Philippines but also worldwide. In her native country, Kahlo will be honoured with the largest-ever exhibit of her paintings at the Museum of the Fine Arts palace, which will be Kahlo’s first comprehensive exhibit in Mexico. Works will be on loan from Detroit, Miami, Los Angeles, San Francisco, and Nayoga, Japan. The exhibit will include one-third of her artistic production, as well as manuscripts and letters that have not been previously displayed. Mahal namin si Frida is organized by Instituto Cervantes, with the collaboration of the Spanish Embassy, AECI, and the Embassy of Mexico.